Today Microsoft and 343 announced the next installment in the Halo universe. It's called Halo 5: Guardians, it's all about Master Chief's journey in moving on from the events of Halo 4, and it'll be out in the fall of 2015 on Xbox One. 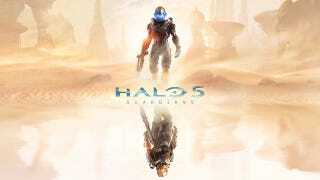 "Halo 5: Guardians is a bigger effort than Halo 4," 343 general manager Bonnie Ross wrote on the Xbox Wire today. "That applies to the content and scope of the game, as well as the technology in what's now a brand new and more powerful engine. Certainly there are some core elements carried over from prior games, but we've invested a huge effort in retooling our tech to take full advantage of the Xbox One's hardware and ecosystem to create worlds and experiences worthy of next-gen."
Ross didn't offer too many specifics about the game, though she noted that the next big Halo will have dedicated servers and run at 60 frames per second. The Steven Spielberg-helmed Halo television series will also be out in fall of 2015, according to Ross. "Many fans noted that I was very deliberate with my phrasing on stage at E3 last year," Ross wrote. "I spoke about a 'journey,' rather than a destination – and that journey definitely begins in 2014 with a giant leap, rather than one small step. We'll give you much more information about our plans for this year at the Xbox E3 2014 Media Briefing on June 9, and we're confident that Halo fans will be pretty excited the special plans we have in store." During a presentation in Los Angeles this week, the 343 team told a group of journalists that Halo 5 will be running on a brand new engine. They mentioned a few times that Halo has always been a huge element of the Xbox platform, and that they're aiming to "move the needle on the Xbox ecosystem." They weren't willing to divulge much more just yet—save for flashing a sunny image of Master Chief holding an assault rifle mirror-imaged underneath what looked like a female spartan holding a battle rifle set against a desert-looking backdrop—but we should have at least a few more details you'll be interested in soon. E3 is just around the corner, after all. UPDATE: The top character is definitely not Cortana, a Microsoft rep confirmed, despite the speculation of a certain Kotaku editor-in-chief.